4-Light 60W Gold Pendant with Dark Bronze Metal Frame Shade Modern to contemporary home style pendant shown with filament bulbs (not included). Straight lines and geometric shape adds sophisticated style. Perfect for minimalist and industrial dicor styles over dining area. 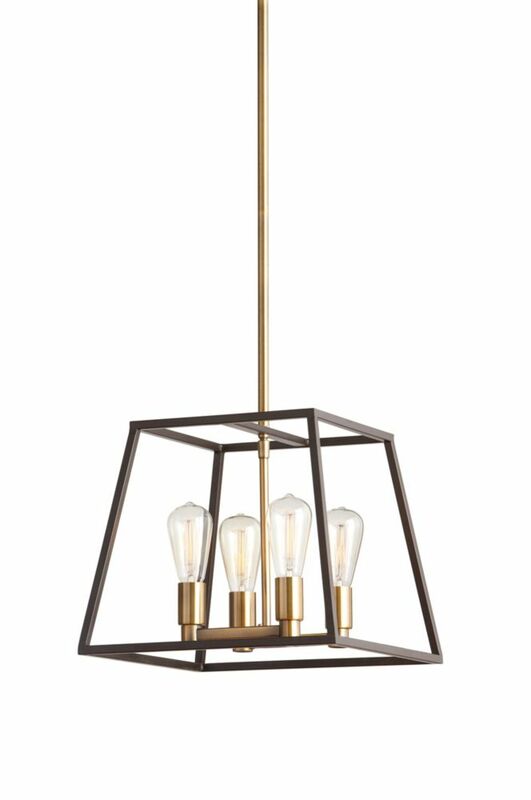 4-Light 60W Gold Pendant with Dark Bronze Metal Frame Shade is rated 4.0 out of 5 by 2. Rated 5 out of 5 by pam s from gorgeous light fixture I purchased 3 of these for our new kitchen to hang over the island. stunning. we have had so many compliments. really impressed. you have two types of lighting with them, a soft amber flow OR the regular lighting. would recommend!!! Rated 3 out of 5 by Jeff from VERY SMALL BASE. OTHERWISE NICE LIGHT The base on thiz light is very small in diameter. So if you dont have a perfectly cut hole in your ceiling its going to show. Took a bit of work to make it look right. Nice light other wise. I purchased this light however when the electricians went to put it up they noticed there was nothing to screw the long tube to the pendant therefore the light would be hanging by the wire. Am I missing a part or is this the design?